I'm decorating like a mad thing at the moment. The weather doesn't lend itself to venturing outside for long periods of time so, here I am, wielding my brush and roller. I've nearly finished the lounge. It was a pale green and is now a very grown-up cream. Gosh it's so lovely and light. I get terribly immersed when I'm decorating and very boring conversationally. I fear if you and I bumped into each other on the street, I'd have very little to say of interest. I'm sure you'd shift uncomfortably from one foot to another and then make your excuses before legging it! As I say though, I am now nearing the end and my mind is turning to accessories. I am not afraid of whimsy and find it's presence in my life very pleasing indeed. 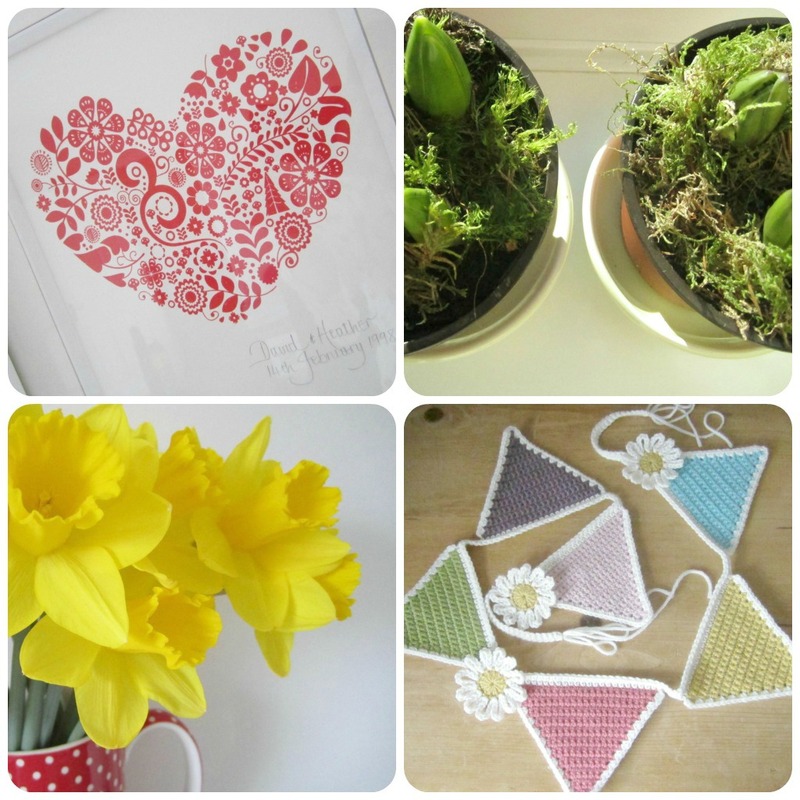 I'm thinking jaunty strings of (naturally) crocheted bunting (using my own pattern with the addition of easy peasy daisies), jugs of spring flowers, framed prints and postcards, strings of fairy lights and stuffed hearts. They all delight me. I particularly adore tulips. 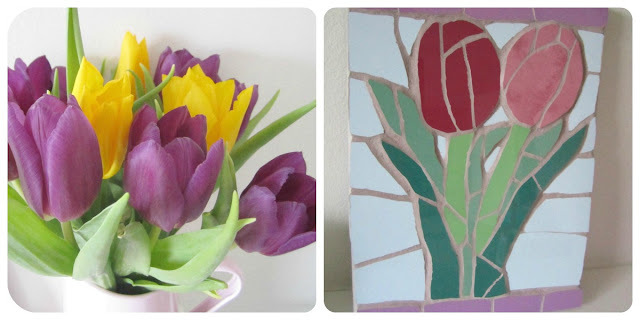 When I saw this post of Lucy's, I fell head over heels in love with her new mosaic tile and hotfooted it straight over to Felicity's shop on Folksy for a look see. This morning, my very own tulip tile came thudding through the letterbox. I'm tickled pink with it. On the crochet front, I have quite a bit more to show and tell but will save that for next time. What I will say though is that I haven't been able to stop popping back and looking at this gorgeous blanket. Everything about it appeals to me big time and I may have accidentally-on-purpose made sure my aran yarn stash is fully stocked. Just in case ..! Good for you! I am wanting to paint but also wanting to move so cleaning and clearing are more important right now. Your "lounge" looks great! I too LOVE Alicia Paulson and everything she does! I have 2 patterns of hers that I have done nothing with yet! LOL! I too love that baby blanket and was thinking of making one so I'd have one on hand for any babies that might come along or just throw it over the back of a chair or place it on a table. She uses organic cotton...does that shrink when it gets washed? Do you know? 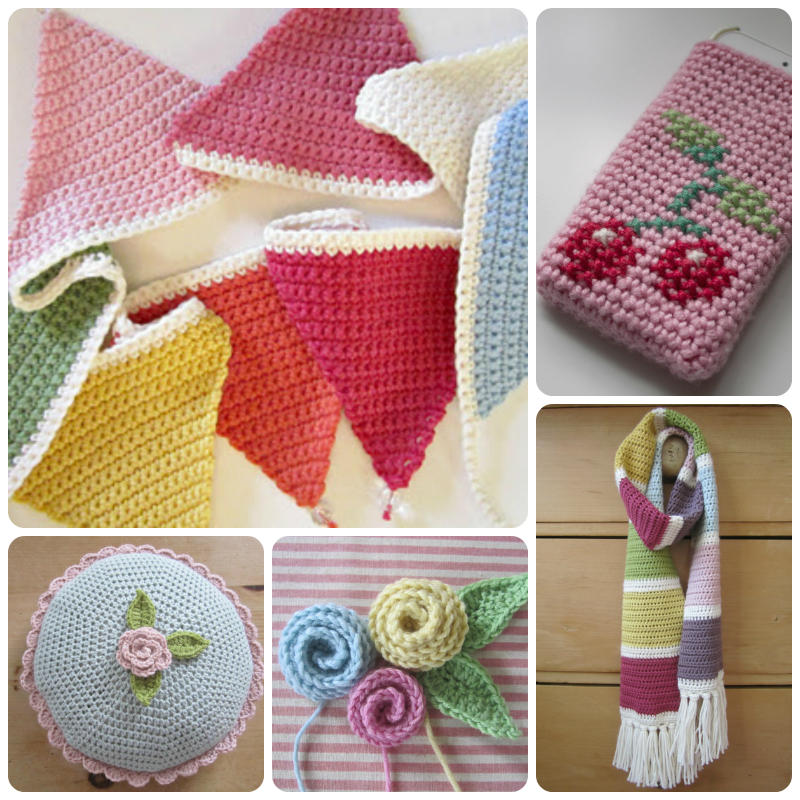 My fingers are itching to place a yarn order and I too have wanted to do a bunting....so many plans and so little time! Take care and pat yourself on the back for a job well done! Our house needs some love and attention too. Love the bunting and the baby blanket adorable! Your room looks absolutely gorgeous! I'd love to go for cream and pale green and calm colours but somehow it is never what we actually end up buying. Until we get ourselves sorted out I'll just admire yours! 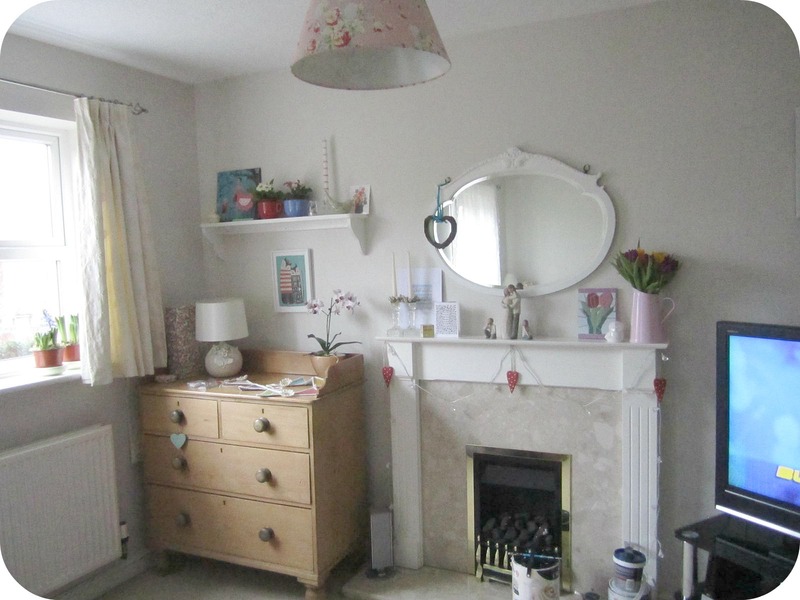 It's looking beautiful and I love that flowery lampshade - gorgeous! Good for you Heather, just focusing on getting it finished - I'm good at starting things but not so good at completing - my sitting room walls are still half finished and patchy white from last year! You have some lovely ideas for the finishing touches too - that's what can keep you going I think! Beautiful room, late comment, I'm rubbish!